Let’s warm up for the winter in Canada and boost the immune system with an elixir of life! I am sharing with you the Ultimate Golden Milk Recipe – Ayurvedic, Vegan and Keto Friendly! My dear readers! What I am sharing with you here today is creamy, comforting, fatty (good fats of course! ), turmeric + ginger-infused, slightly spicy, perfectly sweetened, a super healthy cup of golden milk. Using a traditional method and taking the time (no short cuts here) I am sharing with you my beloved Golden Milk Recipe. However, I am trying a slightly different Golden Milk Recipe to entice you. I have three version of the same Golden Milk Recipe and this is the one I am sharing with you. Good news is the Golden Milk Recipe provided below still follows the traditional Ayurvedic way of making the tea but contains loads of healthy fats therefore exciting news for people following keto or low carb diet. Of course since I have used almond milk the recipe is also suitable for vegans. If you are a dairy lover you can substitute with full fat milk instead of the almond milk and add cream from dairy instead of the coconut cream. Speaking of keto diet, I have been reading blogs or watching videos of many wonderful keto recipes that are healthy and wholesome. So currently I love making fat bombs, keto bread and keto naan bread are some of my favourite. I will share with you. Please leave comments if you want to see these recipes. Be it immunity, anti-inflammatory, protective or energizing the Golden Milk Recipe has taken over the Western wellness world with a storm. The bloggers, social media health enthusiasts, nutritionists and Herbalists all over the world has fallen in love with Turmeric and love making their golden milk recipe. Where in the West and now even in the East many looked down upon the yellow color spice that stained their dishes or hands, but now the health food stores and the specialty grocery stores are filled with numerous versions of turmeric and golden milk products. 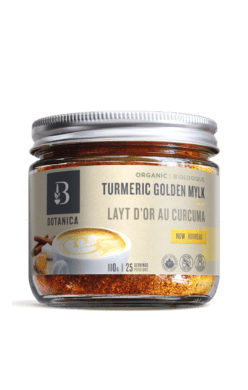 The scenario at specialty grocery stores in Canada has raw turmeric in their produce section, raw turmeric paste and turmeric powders in grocery aisles, many turmeric capsules, tinctures and supplements at supplement sections as well as Golden Milk at their coffee bars. I wish I could take pictures and show you the craziness on turmeric that is going on here in Canada! As I am more familiar with the supplement section I can’t possibly tell you enough how big nutraceutical companies are competing with one another to make the best version of the next turmeric capsule. When I first started drinking it – I didn’t like the traditional and simple Golden Milk Recipe version. Therefore I obviously created by own. When the rest of the world is obsessing about turmeric – as a upcoming herbalist I couldn’t ignore ginger that comes from the same family and has some very similar properties. Therefore you will see both turmeric and ginger in my Golden Milk Recipe. Since winter is upon us – let’s learn how to a make a warm cup of the golden milk that will take care of our immunity as well as provide fatty acid benefits for our brain. Taking Turmeric with Fat is ideal for brain, organ and hormonal health. Step 1: This can be made in advance and kept in the fridge for a week. In saucepan, mix turmeric powder and cayenne pepper with one half cup water. Bring to boil and cook until a thick paste is formed. Store paste in a glass jar and keep inside the refrigerator. To a small saucepan add almond milk, water and add bring to a slight boil. Add the turmeric paste, ground ginger, saffron and the cinnamon. Infuse the spices for 3-4 minutes. Whisk in the coconut cream and coconut oil (or almond oil) and keep it in the stove until the fats come up on the top. Turn off the heat and prepare a cup and a tea strainer. Place the strainer on the cup. Strain and pour the golden milk in the cup. Golden milk helps build immunity and keeps you safe from infections. Golden milk can protect you from cold, flu and cough. An excellent remedy for digestive problems. Small amount of turmeric is considered to be a liver tonic. Golden milk can assist with blood purification. Since golden milk is good for blood and liver it also improves the health of the skin. Adding a secret ingredient in can reduce headaches that happens due to hormonal imbalance. Due to its anti-inflammatory properties it reduces body ache and arthritic pain. Golden milk taken every day can improve brain health and memory. This golden milk recipe can also be considered to reduce the chances of cancer development in the body. This recipe can assist in intermittent fasting. Turmeric also improves vision health. Yogis take turmeric or golden milk to improve flexibility. This Golden Milk Recipe is a must for those who are seeking to boost their immune system and improve their reproductive health. The traditional recipe is time consuming to make. Therefore I take advantage of the Golden Milk from Botanica. In Canada Botanica is a popular brand available at many health food store. They just came up with their Golden Milk powder in an exquisite jar! It contains Organic Turmeric, organic dates, organic coconut, organic vanilla flavours, organic cardamom, organic ashwagandha, organic cinnamon, organic black pepper – which makes it perfect for even a Yogi! This golden milk has been added to my morning warm beverage regime instead of a cup of coffee. However I love making my own recipes from scratch too when time permits. Try this recipe and reap the many benefits discussed above. Why not use fresh turmeric and fresh ginger? If fresh can be used, how much for this recipe? Thank you. You may have to try this. I have used raw when making without the milk. A new recipe coming up.